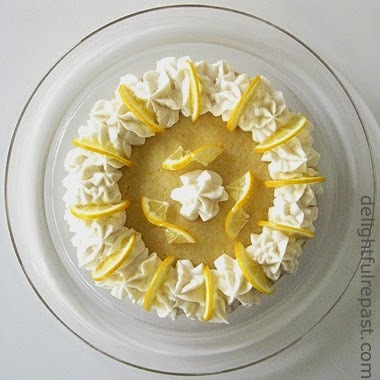 This Meyer Lemon Cake is the cake I referred to a couple weeks ago in the Magical Meyer Lemon Bars post. It was inspired many years ago by the Gateau au Citron recipe in the little cookbook that came with my mother's Cuisinart food processor (the first model on the market). That Cuisinart recipe makes a fine cake; but, as I said, my mother and I thought it would be fun to make a lemon cake that actually used the whole lemon. The recipe has sort of evolved through the years, and I think of my mother whenever I make it, recalling the grand times we had together experimenting in the kitchen. We both liked desserts that were not overly sweet, and we liked the slight "edge" the pith of the Meyer lemon added to the cake. If you were to make it with a regular lemon, which is more sour and has a thicker layer of pith, it would go beyond a slight "edge" right into bitter. The cake can be glazed or frosted, but I like it with just a dusting of powdered sugar or a dollop of whipped cream. This time, since I had some cream cheese on hand, I made half a batch of cream cheese frosting and piped a wide border. This is one cake that can stand up to a sweet frosting. Now that spring has sprung, what are you in the mood to bake? 1 On a plate (so as to catch all the juice) cut the lemon(s) into 1/4-inch slices and remove the seeds. Place the lemon slices and juice in food processor along with the sugar. Process for 60 seconds. Let stand to macerate while continuing the recipe. 2 Preheat oven to 350 degrees (325 degrees if pan is glass). Butter well and lightly flour an 8-inch layer pan. 3 In small bowl, whisk together flour, baking powder and salt. 4 Add the butter to the lemon mixture and process until smooth, about 30 seconds. Add the eggs and vanilla and process until smooth, about another 30 seconds. Transfer the mixture to a medium bowl. 5 Sift the flour mixture over the lemon mixture a third at a time, alternating with the milk in two additions, whisking gently after each addition until just combined. 6 Turn the batter into prepared pan and bake about 30 minutes, until it tests done with a toothpick inserted into the center. Cool in pan on wire rack for 10 minutes. Remove cake from pan and place on wire rack to cool. The cooled cake can be wrapped tightly and stored at room temperature for up to 5 days. Can be frozen, double-wrapped, for a month. Thaw, wrapped, at room temperature. Thank you, Jenn! I've been in that same mood for the last few weeks, too, as you can tell! This cake is fast and easy (even for a pregnant lady! ), so whip one up and let me know how it turns out for you. I love how you decorate the cake...simple yet beautiful and stylish. Angie, thank you! That is exactly what I was going for. I don't like anything too fussy, but I do want it to be pretty! The Meyer lemon: one of life's most perfect treats. This cake: one of the prettiest I've seen in ages. Perfect for a tea. I am emailing my tea friends now and seeing if this cake shall star at our next event. Thank you for sharing one of your treasures. Natalie, thank you so much! As you know, afternoon tea is my "thing" and few thoughts are so pleasant to me as that of one of my recipes gracing someone's tea table. My wife loves anything lemon—especially cake! I bake her a lemon cake every year for her birthday in June. I've even bought a rose shaped bunt cake pan for it. But I've never been happy with the many lemon cake recipes I've tried. Most are not lemony enough and some are just too sweet. I'm anxious to try your recipe, it sounds great! Richard, thank you! Do let me know how it turns out for you. I hope she likes it! I just bought some Meyer lemons. Can't wait to make this cake! Thanks, yummychunklet! Be sure to let me know how it turns out! Thanks, Greg! This is about as fancy as I get anymore. Years ago I used to do "real" cake decorating, but I've decided life is too short for that! Thanks so much, Judy! And it goes great with a cup of tea. Hubby and I both love anything lemon. This one looks like a keeper. Thanks, Lana! Hope you and your husband will like the cake as much as we do. What an intriguing recipe. but I bet the peel adds an extra boost of lemon flavor. I also love that you added some cream cheese icing...that never hurts!! Liz, thank you! Yes, it's very lemony. And you're so right - cream cheese icing never hurts! Thanks, Amy! Spring is my favourite season. What a wonderful cake, Jean! I wish I were still in the States because I gave a bag of Meyer lemons to my daughter when I left. I could have made this instead! Oh, Stacy, thank you! I wish you could have made it! But maybe you can get hold of some Meyer lemons.